What is genocide? I agree that the term has fallen victim to "verbal inflation." Both Hamas and Israel have been accused of war crimes - attacking civilian populations - but to accuse Israel of genocide is a misuse of the term. Rwanda was a genocide by legal standards. President Obama is taking steps in Iraq to prevent a possible genocide by the ISIS against Christians and others. I argue the world community has a "responsibility to protect" in the event of genocide. Even limited military action in Rwanda, such as destroying radio and other communication facilities, could have saved lives. We've said: Never again! We ought to mean that. I hope very much the humanitarian aid and limited air campaign does accomplish the mission without drawing the U.S. back into a long term effort in Iraq. It is worth noting that Christians lived in peace in Iraq before the U.S. Invasion there. At the same time, we need to do everything possible to push the Israeli government into a new peace accord. President Obama is in my prayers, as always, as he seeks to navigate these waters. My prayers are also with all those facing or fleeing violence...whatever the legal definition. "World Council of Churches condemns attack on church in Iraq"
BAGHDAD - Scores of worshipers and seven Iraqi commandos were killed Sunday night during an hours-long siege of a prominent Catholic church in Baghdad, authorities and church officials said. The bulk of the bloodletting happened shortly after 9 p.m. when Iraqi Special Operations troops stormed Our Lady of Salvation church in the upscale Karradah neighborhood to try and free worshipers who had been taken hostage. Several of the hostages had already been killed by the assailants who had taken over the church, authorities said. The attempted rescue prompted to detonate suicide vests, multiplying the death toll. Two Assyrian priests who were presiding over Sunday evening Mass were among those slain during the hours-long encounter. One priest was executed and the other was reportedly killed in an explosion, fellow priest Meyassr Portus said. "People come here just to pray," Portus said Monday, weeping outside the church as residents swept broken glass off the street and repair crews fixed windows and mangled electrical wires. "They are trying to destroy humanity here. Christians just want to live in peace." "The World Council of Churches strongly condemns the criminal act of terror that took place on Sunday in the Sayyidat al-Najat Church in Baghdad and expresses its deep sympathy and solidarity with those who lost their loved ones and pray for a speedy recovery for the injured. The fellowship of the World Council of Churches is deeply troubled by the continuous suffering of Christians in Iraq and continues to stand in solidarity with all churches as they pass through turbulent and challenging times and witness to the love and peace of God in Jesus Christ even amidst hatred and aggression. This is not the first time that such attacks have targeted Christian communities in Iraq. All those responsible need to be brought to justice, and governmental authorities should take their responsibility to bring safety and security to all citizens and particularly to those in vulnerable situation." Let us continue to keep all the people of Iraq in our prayers. NOTE: Please be advised that viewers should be cautioned that the video contains graphic and disturbing imagery. This video, "Accounting for Torture, featuring the voices of religious leaders who support the message of the Physicians for Human Rights report, Experiments in Torture: Human Subject Research and Evidence in the 'Enhanced' Interrogation Program," has been produced by the National Religious Campaign Against Torture. On June 7, 2010, Physicians for Human Rights unveiled a report detailing the alleged involvement of U.S. military and intelligence health professionals in experiments utilizing “enhanced interrogation techniques” on detainees captured after 9/11. Such experimentation on human subjects would be a violation of the legal and ethical protections afforded by the Nuremberg Code, the Geneva Conventions, federal regulations governing human subject research and the federal War Crimes Act. The report also presents evidence indicating that the results of the experiments were used by attorneys in the Department of Justice to craft a legal framework designed to shield interrogators from prosecution for torture and to refine the illegal torture practices used by the U.S. government. An impartial, nonpartisan, and independent Commission of Inquiry is needed to seek the full truth about U.S. torture policies and practices since 9/11. Send an email today. The Iraq War has been opposed since the start by the leadership of the United Church of Christ and religious bodies from the World Council of Churches to the Vatican. But how can our voices compete with this? "We Can't Just Wish For Peace"
Related Link: What Should Christians Do? Three Cheers For Protesting Portland Students! Hundreds of Portland-area school students left their campuses and have gathered at the North Park Block to protest the war in Iraq. "I feel like it was a good thing, and I'll take the consequences if there are any," says Kiana Hamilton, 16, a junior at Wilson High School. Students are carrying signs calling for peace. "Stop the War." "Five too many." "Honk for Peace." 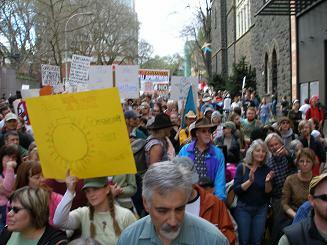 They began marching to the South Park Blocks shortly before 1 p.m., chanting "Peace Now." Ellie Schmidt, 17, a senior at St. Mary's Academy said of the war "it's based on principles I don't stand for. And it's based on alot of lies." The Oregonian's web site promises an update later. Note to Miss Hamilton: Nothing the schools can do to you will matter. Their consequences are meaningless compared to the consequences we all face if we do nothing and fail to stop this war. All of the students who took part deserve applause for their actions and hopefully big hugs tonight from their parents. Related Sermon Podcast: "We Can't Just Wish For Peace"
Reveal the way to Peace in Iraq. Open the way to Peace in Iraq. Lead us in the way of Peace in Iraq. 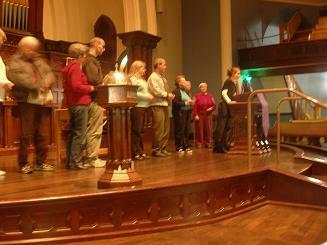 Tonight I spoke at the Witness for Peace Gathering held at Portland’s First Congregational United Church of Christ marking the fifth year of the war in Iraq. This was an ecumenical gathering filled with song and spirit. Use the below link to download the podcast of my remarks for your iPod or personal computer. Representatives from First Congregational UCC, First United Methodist Church of Portland, St. Phillip Neri, and Ecumenical Ministries of Oregon also participated. 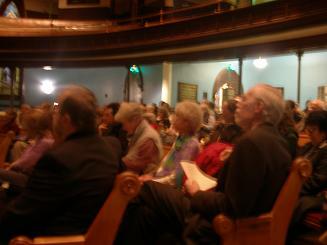 Hundreds from churches across the Portland area attended. Protests are occuring across the nation this weekend calling for an end to the war. This Friday at 7 pm join other Portland-area Christians for a special "Witness for Peace Gathering" calling for an end to the war in Iraq. 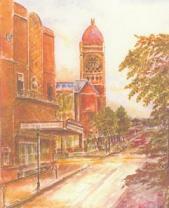 The service will take place at First Congregational United Church of Christ, 1126 SW Park Avenue. I'll be there with members from Parkrose Community United Church of Christ. There will be music, opportunities for reflection, and the lighting of candles. This promises to be a moving and spiritual evening. 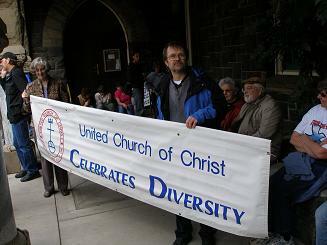 Ecumenical Ministries of Oregon is a co-sponsor of the gathering. Someone asked me recently why this wasn't an interfaith gathering. Interfaith events are important - critical, really, in our pluralistic society - and all of us involved with the gathering this Friday are committed to interfaith dialog and worship opportunities. But on this one occasion we felt it was important to demonstrate the Christian community's nearly unanimous opposition to the war in Iraq and to provide Christians with a chance to gather ecumenically with one another in a show of inter-denominational solidarity. We welcome, however, those of other faiths who wish to attend to show their support for our efforts and we lift up in prayer those of all faiths who are working for peace across the globe. We can be proud this week by the vote taken in the U.S. House of Representatives to require an end to the failed Iraq War. Speaker Pelosi was right to call for a new direction in Iraq because the policy followed by the Bush Administration has done nothing but to increase the risk of terrorism, and caused too many civilian and military deaths. WASHINGTON, July 5 — Support among Republicans for President Bush’s Iraq policy eroded further on Thursday as another senior lawmaker, Senator Pete V. Domenici of New Mexico, broke with the White House just as Congressional Democrats prepared to renew their challenge to the war. “We cannot continue asking our troops to sacrifice indefinitely while the Iraqi government is not making measurable progress,” said Mr. Domenici, a six-term senator who has been a steadfast supporter of the president. Thus Mr. Domenici joined a growing number of Republican voices in opposition to the war just as Senate Democratic leaders are readying plans to put the political and policy focus back on Iraq next week. Pretty soon the only member of the Senate still supporting President Bush’s war will be Joe Lieberman. No matter what you think about the Iraq War we all pause as citizens this Memorial Day to remember those Americans who have given their lives in service to their nation. Click here to visit CNN’s site chronicling the lives lost to date. It is important for us to remember that these Americans are more than just numbers in a casualty count but were real people with families and loved ones left behind. As an Oregonian, I give special thanks to those from my state who have died. My prayers are with all the families grieving losses this Memorial Day and with those seeking to end this conflict so that no more Americans or Iraqis perish. These best way to honor Americans in Iraq would be to bring them home. We need thinking like this in the White House. The U.S. House of Representatives voted this afternoon to continue funding the war in Iraq without setting any deadlines for ending the conflict. Now more Americans will die and more Iraqis will die and nothing will be the better because of it. We find ourselves in an endless cycle of war and death and our political leaders cannot find a way out. First, we propose that American and British troops be replaced by an international police force composed of those who better understand the Iraqi culture. Leaders in Saudi Arabia proposed such a solution almost three years ago. Americans and Brits are not only devoid of any grasp of the language and the religion of the Iraqi people, but are defined by many Muslims as a Christian army that has invaded a sacred Islamic land. Our army’s presence is perceived by many in the Muslim world as a rebirth of the medieval crusades. Second, we propose that the United States appropriate $50 billion to rebuild the towns and cities that the invasion of Iraq has left in shambles. This would be a small price to pay, considering the $2 billion we are presently spending every week in order to keep this war going. Third, we propose that our president go before the United Nations and ask the world to forgive America for what we have done to Iraq, and how we have set back efforts for world peace. He should point out that he is asking forgiveness on behalf of almost all Americans – because we overwhelmingly lent support to the invasion of Iraq some four years ago. He should further point out that our original intentions were good! We Americans were told that we were invading in order to remove the threat of what we thought were Iraqi weapons of mass destruction. If you are willing to support this proposal, go to www.tikkun.org/iraqpeace. You will find an expanded version of this proposal there, along with an opportunity to sign on with us. Do it now, because time is short and the days are filled with evil (Ephesians 5:16). Across the globe religious leaders – including the Vatican, the World Council of Churches and most national protestant and orthodox bodies – opposed the war from the very beginning. We have to keep working to bring peace because the Republicans and Democrats in Congress seem unable to imagine anything but war. Americans and others across the globe have been horrified each time new allegations of human rights abuses against detainees or civilians in Iraq by U.S. forces surface. Religion & Ethics Newsweekly reports that American forces hold a dim view of the people they are there to, in President Bush's words, liberate and protect. The Pentagon has released the findings of a survey of what soldiers and Marines in Iraq think is right and wrong. The report says more than a third of the troops approved of torture in certain situations. Most would not turn in a buddy who mistreated Iraqi civilians, and only around 40 percent said Iraqi noncombatants should be treated with dignity and respect. In our war-time rhetoric we have dehumanized the Iraqi people. It should come as no surprise then that American troops hold such views. And in a war where it is difficult to tell which side the civilians are on - and in most cases it is not the American side - it must become easy at some levels to forget that all people are entitled to basic human rights and protections. This failed war - one that was never moral to begin with - creates new and more frightening ethical dilemmas with each passing day. Those that sent our American troops to Iraq have much to answer for. 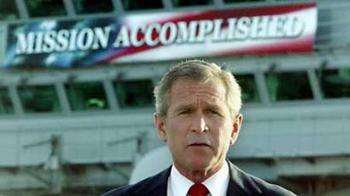 Mission Accomplished In Iraq? Wishful Thinking. The deaths of more than 100 American troops in April made it the deadliest month so far this year for U.S. forces in Iraq, underscoring the growing exposure of Americans as thousands of reinforcements arrive for an 11-week-old offensive to tame sectarian violence. Over 3,300 Americans have now been killed in Iraq and as many as 600,000 civilians have lost their lives. National Public Radio reports today that the armed forces have to accept higher numbers of high school drop outs and ex-cons to meet recruiting goals. The United States Congress will present legislation today to the president that requires the U.S. to start a withdrawal from Iraq by October 1. The president (whose popularity has fallen to as low as 28% in recent polls) has promised to veto the legislation. Religious leaders across the globe have been calling on the U.S. to leave Iraq. Pray for our country to have the wisdom to end the occupation of Iraq and pray for the world to have the wisdom to seek peace in the wake of so much destruction and death that has been caused by terrorists and nation-states alike. Lord have mercy. "Religious Leaders Propose a Way Out of Iraq"
I’ve added my name to the list of endorsers and encourage you to do the same. This video on Iraq (which I found on the WW website) uses the words from Rev. King's Riverside sermon on Vietnam with images from the current conflict. It is powerful.